Kobe Bryant, with his international ties and substantial popularity in China, among other places, is a very versatile endorsement candidate. Bryant, who already has deals with Coca-Cola Co. and Nike Inc., is now teaming up with Madrid-born watch-maker Ivan Castro to sell a Kobe-inspired line of Swiss watches for Nubeo, The Wall Street Journal reports. A limited number of watches in The Black Mamba series will be produced with a reference to Bryant’s nickname. The high-end time pieces will range from $21,000 to $285,000 across three different versions: standard, ultimate, and MVP. There will be 810 standard version watches released, 240 of the ultimate, and 24 MVP watches with the two higher models adorned with a varying amount of black sapphires. The 810 release number is a reference to the 81 points Bryant scored against the Toronto Raptors in January 2006 and the 240 and 24 release numbers both allude to Bryant’s jersey number. The line will hit the U.S. market in the fall, which will also be Nubeo’s first American appearance, coming at a time when global luxury consumption continues to drop. The company, though, is planning a series of print and TV ads that will run around the release date. The partnership between Bryant and Nubeo will extend until 2010, with the option to continue beyond that year. 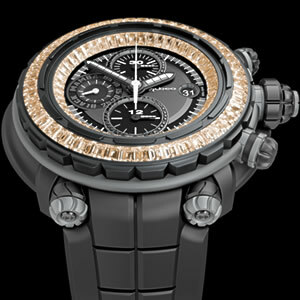 Bryant, a watch enthusiast himself, has taken an involved stance in influencing the watch’s design. He feels that there are similarities between the watch and Bryant’s on-court play, in that there are many unseen intricacies. Whether the line will find success remains to be seen, but Bryant’s partnership with a luxury item, which generally remains reserved for tennis and golf stars, proves his worth as a marketable athlete. Bryant has made a huge comeback following the trial of his accused felony sexual assault charge which saw Kobe lose many of his endorsements. Bryant continues to make his mark as a trendsetter. How an NBA player’s influence will affect a declining luxury market is something to watch for and could dictate future deals for the international superstar.